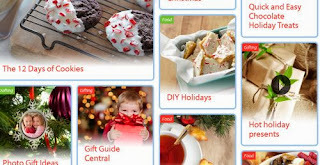 Click the link below to go check out the Holiday Ideas Center for great ideas for this holiday season. Get some great ideas for Christmas. 12 Days of Cookies, Photo Gift Ideas, Gift Guide Ideas, DIY Holidays Ideas, Entertaining Ideas, Delicious Recipes & more.